An 80-mile walk, started on the morning of March 4th at Carteret, New Jersey, will end on March 11th at the Indian Point Nuclear Plant in New York. The purpose of the walk is to publicize opposition to the Pilgrim Pipelines and the Spectra-Aim Pipeline and to pray for water in solidarity with the Ramapough Lenape Nation and Standing Rock and to commemorate the March 11th anniversary of the Fukushima Nuclear disaster. The walkers are being led by Buddhist monk Jun-san Yasuda, a nun of the Peace Pagoda and New Jersey Peace Action. People gathered from Okinawa, Japan and New Jersey, as well as several other states. 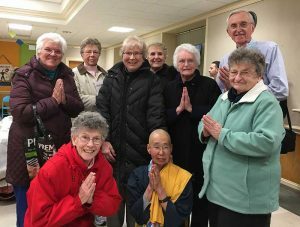 Several sisters and friends attended the evening’s ceremony on March 4th to greet the walkers and participate in a discussion and blessing for WATER at Morrow Memorial Church, Maplewood.